Last night was a little rough, every cough I would jump out of bed and race to Charlottes room to make sure she was ok, and every time, she was. As usual, she was up at 5:50 am and it was just like before all of this with a “Goodmorning mom, (kiss on the cheek) did you sleep good?” It was so nice to have some normalcy in our life. I asked what she wanted for breakfast and she said a quesadilla! Yep, that’s what I made her and she ate it all! 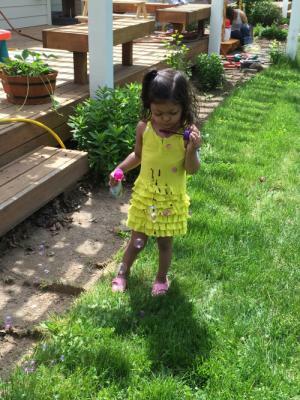 We played inside, then she wanted to go outside, we blew bubbles, played in the sandbox and just enjoyed the beautiful day. We had multiple friends being over groceries and meals, it was so nice not to worry about going to the store. I was nervous coming home, having to realize that this is real, it’s following us to our comfort zone. But in reality, we need to live for today, and TODAY was a good day!